Leeds Rhinos Foundation is backing the Rugby Football League’s ‘Enjoy the Game’ initiative and has relaunched their own Rhinos Respect campaign. Enjoy the Game’ is a game-wide campaign that will continue to stress the importance of behaving with respect at all levels of the game. This year, there will be fresh impetus on the ‘positive’- helping to promote encouraging environments throughout Rugby League. As part of Leeds Rhinos Foundation’s Rugby League Development Plan, sponsored by Mears Group, Foundation staff will be working with all Leeds Rhinos’ Ambassador Clubs to promote the ‘Enjoy the Game’ and Rhinos Respect campaigns. 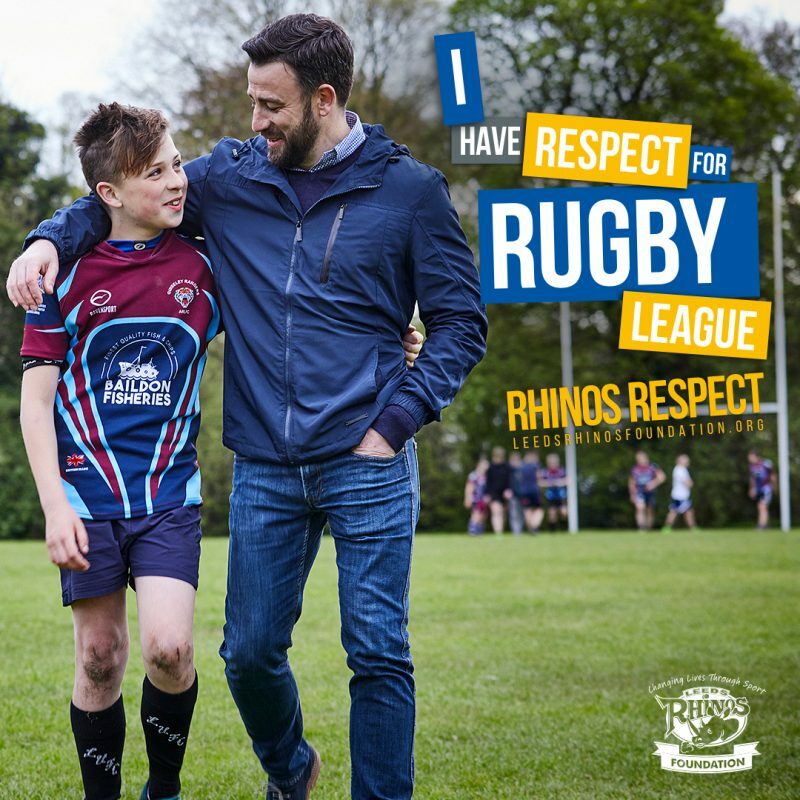 Rhinos Respect is a response to concerns from across the game about unacceptable touchline behaviour in Rugby League and it aims to improve the conduct of those involved in the game to create a more positive place in which children can play. “Our aim at Leeds Rhinos Foundation is to promote, at all times, a respectful and all-inclusive environment that is not intimidating or hostile for families, players and referees. · 46% of parents of children playing said they least enjoyed the behaviour of parents and volunteers. · 25% players currently playing said they least enjoyed the behaviour of parents and volunteers. · 54% of volunteers within the game said they least enjoyed the behaviour of parents and volunteers. Kevin Sinfield MBE, Leeds Rhinos Director of Rugby and Ambassador for the Rhinos Respect campaign, believes this is an important issue for the game to address. “Respect must come from us all; whether you are a professional player, a community club player, a referee or match official, young or old, a parent or club member,” said Sinfield. As part of the Rhinos Respect campaign, each Leeds community club will receive posters which will be displayed around their clubs asking for spectators to be respectful to those playing the game and to set a good example. Leeds Rhinos Foundation will also be promoting the respect messages through their social media accounts and will share video messages from Leeds Rhinos’ players and staff. For more information, contact sam.horner@leedsrhinosfoundation.org.